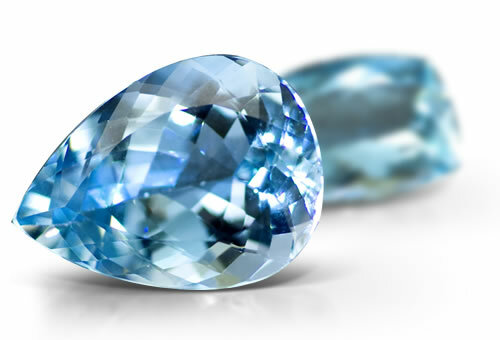 The birthstone for March, aquamarine is one of the most popular members of the beryl family, a sibling to emerald, morganite, bixbite, heliodor, and goshenite. The color ranges, depending on the relative concentrations and location of iron within the beryl crystal structure. Aquamarine's tranquil color and crystalline clarity capture the beauty of the sea, which is fitting as its name is formed from the Latin words "aqua," meaning water, and "mare," meaning sea. A favorite among gemstone lapidaries, rough aquamarine is relatively easy to fashion, so lapidaries often create imaginative aquamarine cuts and shapes. Chatoyancy or asterism are sometimes found in aquamarine. The RI of aquamarine is usually lower than other beryl varieties and runs between 1.569 to 1.575 and the SG tends to be about 2.67. Aquamarine is a type I clarity stone. Stones are typically clean but sometimes contain "fingerprints" and liquid inclusions, 2-phase or 3-phase inclusions, hollow or liquid filled parallel tubes, spiky cavities and tubes parallel to the length of the crystal that look like rain, mica flakes. Crystal inclusions include apatite, almandite and spessartite garnet, quartz and tourmaline. Star aquamarine will have a weak 6 or 4 rayed star and sometimes both.